California Gold Video Slot Guide & Review - Casino Answers! California Gold is a 5-reel, 25-line video slot developed by Vegas Technology. The California Gold video slot features scatter wins, wild substitutes, free spins and a bonus game. 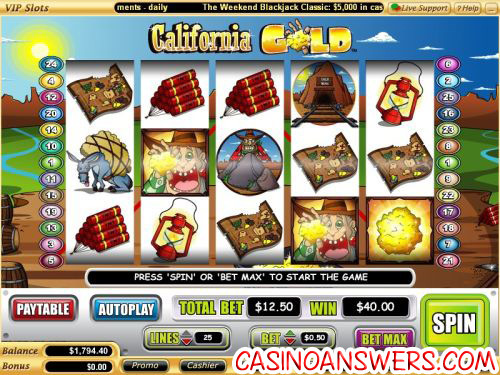 You can play California Gold at US-friendly Vegas Tech online casinos such as Online Vegas Casino and VIP Slots Casino. The California Gold video slot’s theme, much like the Gold Rush Rival slot machine, is based on the California Gold Rush that ran from 1848 to 1855. Once gold was discovered, 300,000 men, women and children flocked to California. There is a common stereotype of old crazy prospectors from the California Gold Rush, which is where the video slot gets its character. Symbols in California Gold are the miner wild symbol, scattered gold nugget symbol, the miner hiding behind a rock, a railroad leading to a gold mine, a tired pack donkey, mining truck full of gold, gold pan, dynamite, map, lantern, barrel and pickaxe. A lot of Vegas Technology slots use the standard generic symbols (A, K, Q, etc. ), and it’s nice to see that California Gold does not rely on any of these. To play California Gold, select your bet. Available wagers are $0.01, $0.05, $0.25, $0.50, $1, $5 and $10. The maximum bet is $250, but you can bet as little as a penny. There are a decent number of options that should suit most slots players (including high rollers), but we wouldn’t have minded to see a couple more betting options in there. Once you have chosen your bet, you can set the number of active paylines. We recommend keeping it at 25 paylines, as you don’t want to miss out on any winning combinations. Once you’re ready to play, hit “Spin” or “Bet Max” to play all 25 lines. The California Gold slot machine has a 5000 coins top fixed jackpot. Five miners behind a rock symbols on an active payline will win you this jackpot. California Gold is not great for its fixed payouts, as the next best thing is 500, then down to 200. However, these jackpots can be doubled if they are completed using the game’s wild symbol. The wild symbol is the old crazy miner holding a large gold nugget. When he completes a winning combination, he will scream “yahoo,” and his tongue will flail about (talk about wild). He only appears on reels 2, 3 and 4 and will substitute for all symbols except the scattered gold nugget. If three or more scattered gold nugget symbols appear on the reels, you will trigger the free games feature. You will win 10 free spins and a 3X multiplier. All of your wins will be tripled. The free games feature can be re-triggered. Free spins are played at the lines and bet of the triggering spin. Free games feature wins will be added to payline and scatter wins. If the wild miner symbols appears on the second, third and fourth reels at the same time, you will trigger the California Gold bonus game. In the game, you must choose one of four mines. The miner will grab up to five nuggets while going through the mine. Each nugget of gold weighs a certain number of ounces. The total win for the bonus game is how many ounces you have collected multiplied by the triggering bet. You can trigger the bonus game during free spins. In California Gold, payline wins are multiplied by the amount staked per payline, whereas scatter wins are multiplied by the total amount staked. Scatter wins will be added to payline wins. Only the highest win per payline will be paid out. Coinciding wins on different paylines will be added together. All wins occur on active paylines only except for scatter wins. All symbols pay left to right only except for wins using the scatter symbol. The wild miner symbol appears on reels 2-4 only and substitutes for all symbols except for the scatter symbol. All wins using the wild miner symbol will be doubled. Vegas Tech provides us with yet another great video slot. The bonus game is excellent, as is the free spins feature with its 3X multiplier. We also enjoy the crazy old prospector theme that the game has. To try California Gold out for yourself, you’ll want to take advantage of the $5000 multi-deposit signup bonus at Online Vegas Casino. In addition to all of those great bonuses, Online Vegas Casino gives you 4 free slot tournament entry tickets where you can enter California Gold slot tournaments! For full details, please visit Online Vegas Casino. Where can US players try out the California Gold video slot? US players can play California Gold at any Vegas Tech casino, including Online Vegas Casino, VIP Slots Casino or any of the many great online casinos on our list of Vegas Technology casinos. Do I need to download any software to play California Gold? Online Vegas Casino gives you the option of downloading their software or playing their Flash instant play casino. If you don’t have Flash installed on your computer or you have any problems playing the California Gold Flash game, you can download the newest version of Adobe Flash Player. Can I play California Gold for free? Yes, Online Vegas Casino or any other online casino offers practice play in additional to real money play. This is a good way to see what games you like and which games you don’t like so much. Does California Gold have a progressive jackpot? There is not progressive jackpot on the California Gold slot machine. 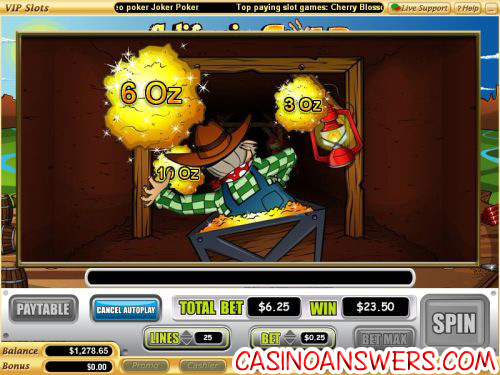 However, Online Vegas Casino offers several different progressive jackpot slots including Mega Money Mine and Pay Dirt. Where can I play a good 5 reel video slot? What slots have fixed jackpots?